Have you every gotten so deep in thought that you climbed the “wrong” mountain? It just happened to me. Of course, in the high country, there really isn’t a “wrong” mountain to climb. It just wasn’t my plan that day, but it turned out to be another wonderful day in the Rockies. I headed out from the St. Vrain Trailhead, a National Forest Service trailhead, outside of Allenspark, Colorado. As I well knew, the trail name that I was on was St. Vrain Mountain Trail. That’s more than a good hint that you’re going to follow this trail to St. Vrain Mountain, a 12,162 ft / 3,707 m peak that I expected to still be fairly snowpacked. 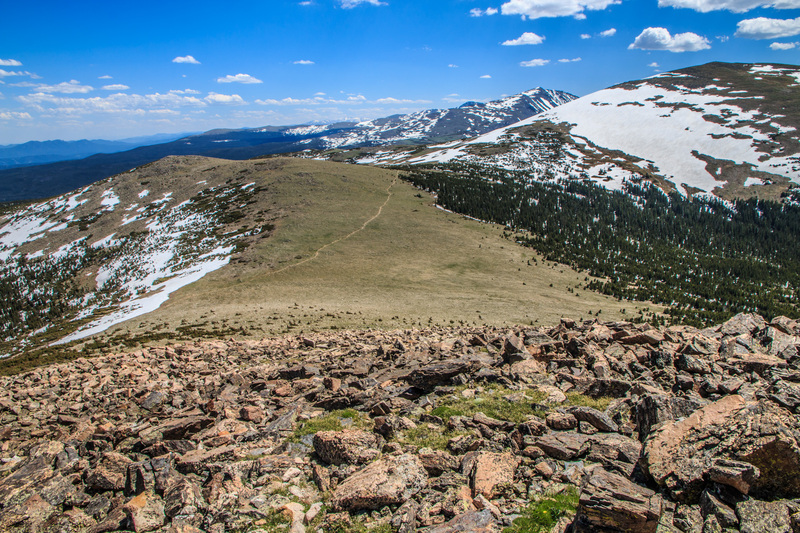 My plan was to veer off the trail at the base of Meadow Mountain (11,632 ft / 3,545 m) and climb to the summit. One of my maps showed a trail heading up Meadow, but I doubted that it was there. I followed the trail, absolutely enjoying the isolation and just being in nature. 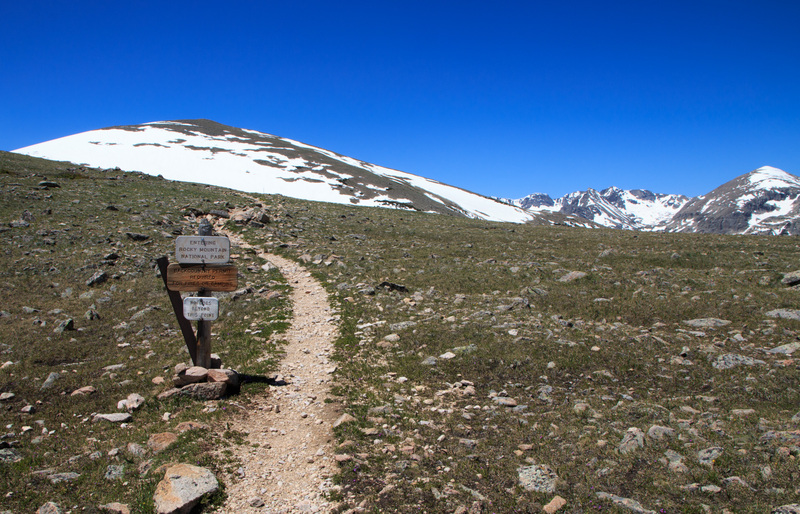 Once I broke above tree line, I saw a sign that is always exciting to see – Entering Rocky Mountain National Park! The view went from wonderful to absolutely gorgeous! My mind was completely absorbed in the beauty of seeing the Wild Basin area of RMNP from another angle. I wanted to go into the Park, and get what I knew would be an even more spectacular view. I flipped my phone out, opened my Gaia GPS app (one of the best hiking apps! ), and quickly glanced at the map without thinking. My mind was set on moving down this trail. So when I saw Meadow Mountain on the screen, and looked up, I thought that one straight ahead must be it. I was a little bummed that it was more snowpacked than I expected, but decided I would see how far I could get. As I made my way along the trail, the view behind me just became more and more stunning. Chiefs Head, Pagoda, Mount Meeker, and Longs came into view as I unknowingly headed further and further away from the mountain that I had planned to climb. Once I reached the base of the mountain, I began working my way up the mountain, going rock-to-rock to avoid stepping on the fragile tundra. The snowpack was fairly crusty, and I was able to move through a few of the snow fields without much trouble. I was unsure how deep the snow was until I postholed, and found myself waist deep. While I probably could have summited, the risk of postholing and slicing my leg, or something more precious (considering how deep I went), on a boulder was just not worth it. So now, after a couple of hours of not checking my maps, I opened my phone again and looked at little closer. The first thing I saw was my elevation. I was at over 11,600 ft. Since I knew that was the approximate height of Meadow Mountain, I began to laugh out loud. I looked back at Meadow Mountain, and knew that was the one that I meant to climb! I worked my way back down the mountain. At first, I was a little annoyed with myself for heading up the wrong way. The more that I thought about it, the more satisfied I became. I was in the mountains. It was a beautiful day. I was happy. What more could I ask for? 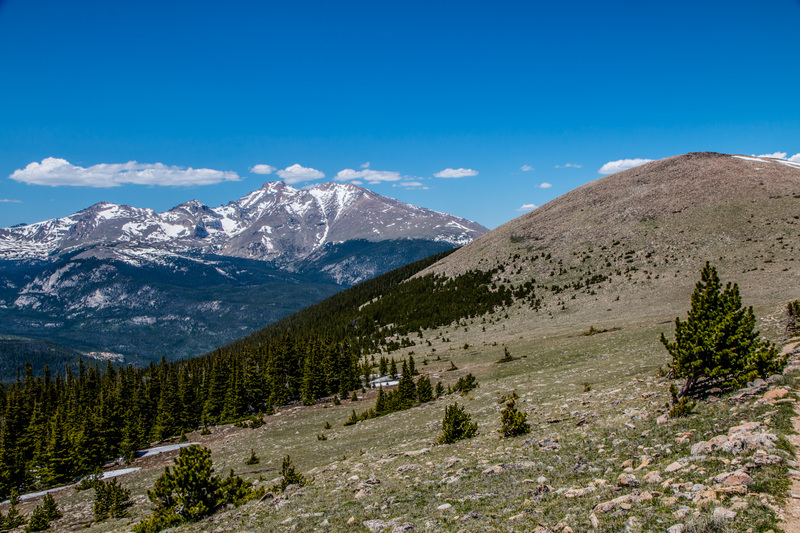 Part way up Meadow Mountain, I looked back at the trial that I had followed and at St Vrain Mountain. There is just something freeing about hiking along those alpine trails. If you haven’t done it, get it on your list. There is a sense of peace and oneness that words and pictures fail to describe. It really doesn’t matter if you summit a little mountain or a big one. Stepping onto any peak is an emotional rush as a completely different view of the world opens up. Meadow Mountain may not be the highest peak around, but WOW what a view!